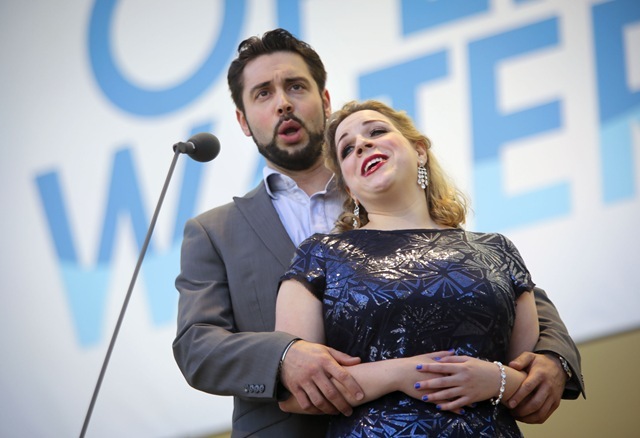 Saturday saw huge crowds braving the “cold” 70-degree weather and troublesome winds that blew sheet music everywhere at the outdoor Meyer Amphitheatre in West Palm Beach for Palm Beach Opera’s second winter concert on the waterfront. On the stroke of 2 p.m., conductor Greg Ritchey brought down his baton for a rousing National Anthem, like you’ve never heard before, from chorus and orchestra. 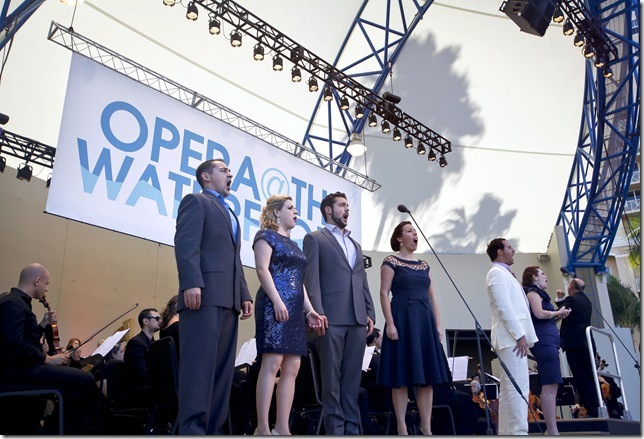 This great chorus must be given more work in future; perhaps the first part of the program can be devoted to opera choruses and the second half to Young Artists. The afternoon had many opera lovers arriving early to stake out their portion of ground, and plenty of picnics were in evidence. General Director Daniel Biaggi announced that the concert was being streamed on the Internet and that audience members could follow simultaneous translations in English on their Palm Beach Opera app. Next year, the concert will be on Dec. 12. The final section of Rossini’s overture to William Tell opened the proceedings. The wind howled around the mics, making things difficult for the sound engineers. In spite of this, the orchestra sounded wonderful, and my neighbor said she was astonished at the high quality of their playing. 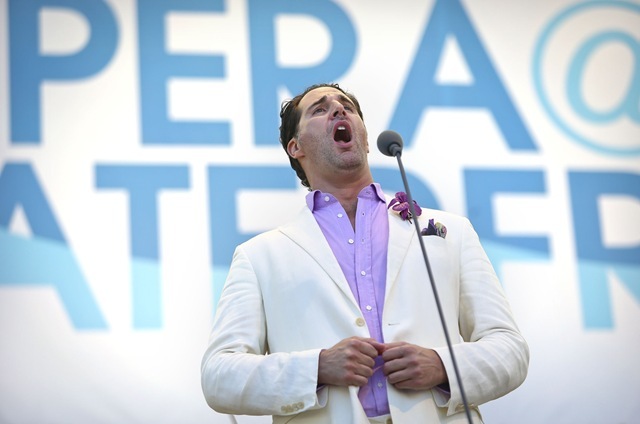 The nicely blended voices of opera stars Michael Chioldi, baritone, and James Valenti, tenor, launched the singing with “Dio che nell’alma infondere,” the duet from Verdi’s Don Carlo. Both men were strong and forceful in their solos with rich sounds and well-placed delivery. Particularly sweet was their duet when they sang pianissimo toward the end; Valenti was quite impressive in the higher register. Mezzo-soprano JoAna Rusche came next with “Voi che sapete,” from Mozart’s The Marriage of Figaro. I felt her lower notes could have been stronger, but her added “decorations” in the upper part of her lovely voice were quite impressive. A newcomer to the Young Artist program, tenor Robert Watson, was heard next. He produced a pleasant, easy-flowing sound in his aria from Puccini’s La Bohème, “Che gelida manina.” Very confident and relaxed in his demeanor on stage, he was winning hearts and minds with his exquisite lower and middle range, but he pushed his top notes too hard, nearly breaking at the end. Tenor Nicholas Nestorak, who came next, struggled for the many high Cs required of him in “Ah! mes amis, quel jour de fête” from Donizetti’s Daughter of the Regiment. Standing back from the mic, a sound engineer came forward to the stage encouraging Nestorak to move nearer the mic. Knowing the mic would pick up his faults all too easily, Nestorak stood his ground like the pro that he is, just about making each high C with “half a voice.” His sensational performance of this same aria is best remembered from last year; singers cannot be “on” 100 percent of the time; those two thin vocal cords, at operatic level, need rest from time to time. The worthy chorus sang Verdi’s “Va, pensiero,” from Nabucco, which cemented my belief they need to be half the program. Mezzo Rachel Arky then took on the daunting task of the composer’s aria, “Sein wir wieder gut,” from Strauss’ Ariadne Auf Naxos. Giving it an all-out dramatic rendition, she conquered it to loud applause. Back for another all-male duet came Chioldi and Valenti, this time with Bizet’s popular “Au fond du temple saint” from The Pearl Fishers. Again, it was a lovely blend of voices, with the necessary intensity in their agitated solos, as the two men argue for the love of the same woman. Harp and flute accompaniment sounded wonderful. Moving to the second part of the program, the Palm Beach Opera Orchestra led off with the Intermezzo from Mascagni’s Cavalleria Rusticana. It’s a lovely piece but hardly suitable for outdoors with its quiet string playing. A robust Verdi overture would have been a better choice here. The blustery wind was no doubt the culprit in distracting ears from this amazingly good band of musicians during the piece. The sextet from Lucia di Lammermoor (“Chi mi frena in tal momento”) was nicely performed but lacked the intimacy of the staged version of Donizetti’s dramatic work since the singers were spread across the stage, anchored to microphones in series of twos. 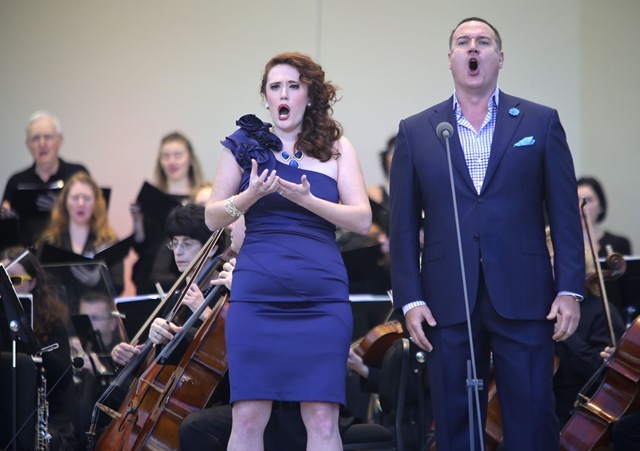 Guberman and Arky returned next to sing the duet “Mira, O Norma” from Bellini’s Norma. They were good, very good, but something very distressful happened while they were singing. On the perimeter road outside the park the continuous sound of revving motor bikes was heard. It wasn’t the first time; they had been heard earlier. Now the revving was persistent and obviously meant to be disruptive. Next year, I suggest motorcycles be offered an alternate route as far away as possible from the singing. Like the professionals they are Guberman and Arky sang through the noise, ignoring this modern form of claque, a phenomenon as old as opera itself. Chioldi next sang the “Te Deum” that closes Act I of Puccini’s Tosca, backed by the illustrious chorus. He was magnificent. His ripe, rich, warm, manly voice soared over the excellent chorus as Scarpia calls out the name of Tosca, the opera singer he most desires. Ritchey is to be congratulated for leading such massive forces in a splendid and stirring performance. The audience rose to their feet with acclaim. Soprano Bridgette Gan, from last year’s class of Young Artists, wowed the audience with her fantastic and brilliant singing of “Glitter and Be Gay,” from Leonard Bernstein’s Candide. She was sensational, and got the loudest applause. Valenti made his last appearance with “Dein ist mein ganzes Herz” from Léhar’s operetta, The Land of Smiles. He started well by floating a mellifluous rich sound that was very captivating. As he neared the end with its higher register he choked off his top notes by lowering his jaw, trapping the sound. It must be said that singing into the wind can create enormous difficulties for singers. I was amazed at how well these singers coped in such tough conditions. Musicians in the orchestra were using wooden clothes pegs to hold down their sheet music. At the finale,the combined forces joined to make a rousing performance of Bernstein’s “Make our garden grow” from Candide, an opera I would like to see this company attempt. It was incredible hearing the massed voices render this inspirational music with energy and conviction. Nothing could top it, which is why the sensible people in charge passed up the “Libiamo” from Verdi’s La Traviata as an encore, though there were cries of “encore” all around me. Palm Beach Opera’s mainstage season opens Jan. 16-18 with performances of Giacomo Puccini’s La Bohème at the Kravis Center in West Palm Beach. Keri Alkema is Mimi alongside Dmitri Pittas as Rodolfo for Friday and Sunday’s performances; Saturday night, Mimi will be sung by Eleni Calenos and Rodolfo by Anthony Kalil. Ellie Dehn is Musetta, and Luis Ledesma is Marcello; Daniele Callegari conducts. Performances are at 7:30 p.m. Friday and Saturday and 2 p.m. Sunday. Call 833-7888 or visit www.pbopera.org.